As we find ourselves amid an economic crisis, most people realize the need to budget efficiently, yet still don’t have a solid grasp on their finances. The easiest way to gain control over your cash flow is to set a budget and stick to it. Numerous technological companies have created budgeting software to assist users in their budgeting, but how much do these software options truly help? Here are five reasons why you should consider using personal budgeting software. When it comes to your money, you need to know exactly where it’s going. The more organized you are with your finances, the better you will feel about your budgeting. With personal budgeting software, you will be able to track your income and expenses with ease, knowing exactly where your money is coming from and where it’s going when it leaves your account. Many software options available allow you to categorize your spending, providing you the ability to set sub-budgets within your overall budget. A truly complete budget will take into account necessary monthly expenses, entertainment, groceries, gas, emergencies, and savings, all of which can be done with personal budgeting software. If you find yourself scratching your head in amazement as you wonder where all of your money went by the end of the month, you are not alone. Instead of living paycheck-to-paycheck and worrying about how you’ll cover all of your monthly bills, invest in budgeting software. This will allow you to track every payroll check and deposit that goes into your account, while also allowing you to view every expense that leaves your account, whether through an automated bill pay or a simple ATM withdrawal. Saving for the future will never be easier with the right software to help you attain your goals. If you’re worried about not knowing how to properly manage your money, using personal budgeting software will boost your confidence, knowing you can tackle your budget and debts. With your new software, you will be able to track your finances and know if you can afford that vacation or fast food meal before giving out your credit card information. No longer will you be second-guessing your financial decisions. When you’re confident in your financial decisions, you will be able to handle any budget you set for yourself. If you’re currently doing your budgeting by hand, you can make some very costly errors, leaving you to wonder how you could possibly rebound. 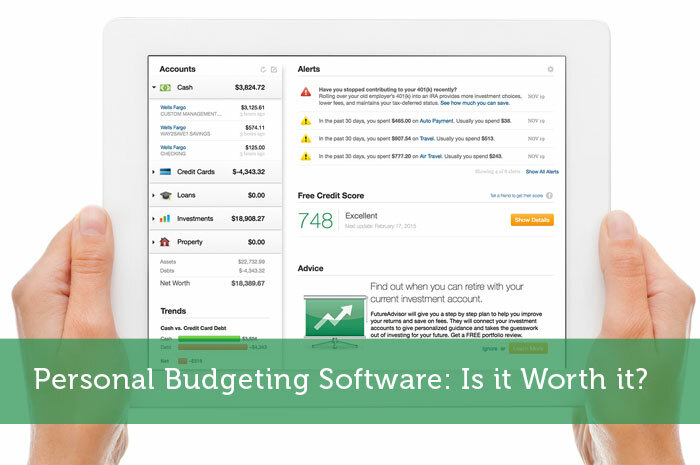 Choosing the right personal budgeting software will help you catch mistakes before you even know they exist. The software options available will allow you to review your past payments, track your cash flow, and notify you when you’ve made an error in your budgeting. Many of these software programs allow you to pay your bills directly from the software via your bank account, saving you the headache of tracking down where your money went and why it’s no longer in your account. While some people have a knack when it comes to managing their finances, others need motivation to properly budget their money and get their finances on track. People often find themselves getting bored if there isn’t something exciting to keep them on track with their budgets. While simply getting on track financially should be enough of a motivator, personal budgeting software offers an additional element of motivation. These software options show you just how your financial situation is improving (or deteriorating), and will even provide tips that help you, specifically, plan ahead. With this new found excitement, you’ll develop a growing desire to create and maintain to a budget. Personal Budgeting Software: Is it Worth it? I’ve never used a software, I’m more of an Excel spreadsheet type of guy. I feel that if I enter the number manually every month, I have a better feel of what I’m doing with my money. Don’t get me wrong, those software are great and I highly recommend them for people having trouble keeping track of their expenses/money, but I feel happier doing it myself. I’ve used Quicken for years, and I enter everything manually and reconcile (you’d be surprised how often the bank and credit card companies make errors). But this still allows me to easily scan how I’m doing against my budget, check my net worth, track any balances (whether debts or investments/assets), compare previous time periods to current, etc. I am definitely in better control of my finances now than I was when I didn’t use the software. I would recommend everyone find a way to track and manage their finances that works for them, whether it’s a spreadsheet, an online tool, software or an app. I’ve never used a budgeting software, but I do use spreadsheet to keep track my expenses. Several budgeting software that I have found so far don’t really fit my style, so I stick to spreadsheet. Whether budgeting software is worth it really depends upon the person. If it helps a person that previously could not manage their finances well to improve their skills and discipline, then it’s well worth the cost! I’ve used software, handwritten ledgers and spreadsheets. I found the ledger book was the least intimidating to get my spouse on board, even though he’s really tech savvy! I’ve been looking into software again though because I really like being able to pull reports quickly to compare spending over time/to budget, etc. I have never purchased software. If I felt like I was really careless or just couldn’t figure out where the money was going and the money didn’t add up, I would think about purchasing it. I am not very good with excel spreadsheets, and I know from my statistics class, it was very difficult for me. Right now, I do the old fashioned pen and paper way, but I have been tempted to purchase different budgeting software to help me out with this and save some time. For those of you who like the envelope system, or traditional spreadsheet budget, consider trying You Need a Budget (YNAB). I previously used Mint. Mint is nice, but I feel that the software doesn’t force you to create a good budget or stick to it. Having your transactions entered automatically is the worst feature of these programs, even though it’s convenient. I like YNAB because it’s an entire philosophy instead of just software. The software encourages you to budget in a smart way, giving every dollar you earn a job. Saving is a job. It also encourages you to save a little bit of money each month for unexpected expenses that pop up. Software like Mint has the ability to do this, but it’s a core of the philosophy of YNAB. You need to be saving a little each month for those car repairs, or you will pay when it happens and you aren’t ready. YNAB does cost money, but it’s much better than Mint if you want serious control over your budget. I’ve played around with a few different softwares but never stick with it, I prefer my excel sheet! The best way you can budget is write down EVERYTHING you spend money on for 2-4 months. Then you will really know where your money is going. Once you have that you just have to look at you take home pay. Then figure out if you are happy with it, need more money (second job or preferably better paying job) or are a lost soul. At any rate, until you know where and how much you are spending you can not make a budget. I just figure if i can have a positive balance at the end of the month with all bills paid in full I gotta be doing something right. And yes, I do take vacations, lately a cruise a year, and enjoy myself.